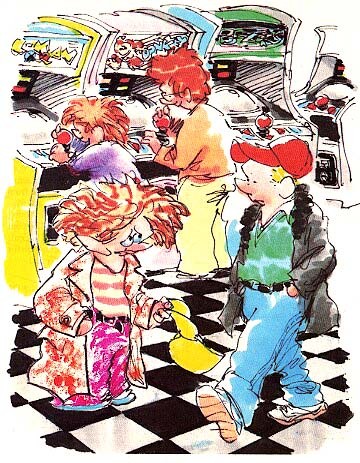 Arcade Games: Brother Can You Spare A Token? Brother Can You Spare a Token? There is something new rolling into the arcade today. It is not an innovative video game; it is a token. To a commuter or a city dweller who rides public transportation frequently, a token is nothing new, but to an arcade game player, having his dollar converted into three or four tokens may be quite a surprise. This article will help you understand what tokens are, and why they are used instead of quarters. A token, according to Webster, is "a piece of metal issued for currency with a face value much above its real value." In many arcades, you receive a token in exchange for a quarter. That token functions in specially converted games just as a real quarter does in most other coin-operated machines. The tokens themselves are manufactured in large quantities out of very inexpensive materials. Most have some form of message stamped on their surfaces to remind you what they represent and where they can be used. Why would anyone want to use a token in the first place; isn't a quarter just as good? Not to most arcade hall owners. Tokens offer many advantages in the arcade. Most of these advantages benefit the game room operators, but some help the players as well. The problem with quarters is that you can spend them anywhere you like. If the manager of an arcade hall goes to the trouble of breaking a dollar for you, he wants those quarters--all of them--in his machines. Unfortunately, there is nothing that forces you to spend them at his establishment. If, however, you receive tokens that are honored only in his establishment, you have no use for them elsewhere. In such cases, you usually feel obligated to spend them right there and then. Americans, being an orderly people, don't want strange tokens jingling around in their pockets all day long, so they spend them to simplify their lives. This is exactly what the operators want. Another inducement to spend is the feeling that tokens are "play money." Somehow, parting with a token is not quite as painful as parting with a quarter. If you go to an arcade in which the machines accept only tokens, you can bet the owner is raking in more money than he would if the machines took quarters. Arcade machines don't come from the manufacturer ready to accept tokens; they must be converted. Let's say you have just opened an arcade, and you want to use tokens instead of quarters. You could just grab a copy of PlayMeter, the largest trade magazine of the arcade industry, and start flipping through the pages looking for the right ad. A few phone calls later, you will find yourself paying someone to convert the coin mechanisms to accept tokens. Some mechanisms are fancier than others; it all depends on the tokens to be used. Some tokens are merely metal disks that vaguely resemble coins, whereas others may have little grooves cut into them. Tokens themselves are not universal. You can't take any token and use it in any arcade machine that is adapted to receive tokens; the coin mechanism itself must be designed specifically for that type of token. One of the worst ailments that can strike an arcade game is a jammed coin mechanism. Obviously, if a machine can't accept coins, it can't be profitable. A coin mechanism can fail if an imperfect coin is placed in it. At best, this happens rarely. But, every time it does happen, it costs the owner money in the form of lost revenue. Tokens have the advantage that they are used solely for vending machines, thereby avoiding the misuse to which common coins are subject--how often have you tried to remove a screw with a token? Since tokens lead a rather pampered life, they tend to last longer. If a token is somehow damaged, it can be replaced with another inexpensive token. Because tokens are less likely to jam machines, game players find more games in working order. Tokens also offer the owner the opportunity to monitor his profits more carefully. Most managers agree that it is hard to find trustworthy employees--particularly for a job that requires the handling of cash. Giving an employee keys to the machines is risky in a hall where the games accept quarters. These keys allow access to coin boxes filled with quarters. If the games are filled with tokens, the manager can be less wary when handing over the keys. Another advantage is that a machine full of tokens is less attractive to thieves. The owners of arcades obviously want people to play their games. Because tokens are so inexpensive to manufacture, they can be distributed as giveaways or freebies to induce players to try a certain game room. Tokens also offer cheap advertising space. Most token manufacturers offer a variety of tokens with many slogans and messages on them; some will even print special messages, for a price. If you haven't seen a token yet, you probably will soon. It is a slow process, but more and more arcades are converting to tokens. Their advantages are many, and their drawbacks few.